Nail polish – and the nail art that it can used to create – have taken social media by storm in recent years, with numerous Instagram feeds and Facebook groups dedicated to it. However, there are plenty of uses for nail polish that have nothing to do with nail art. Some are creative, some are fun and some might even help you out of a jam. Take a look at some of these exceptional uses of nail polish. Slightly Smooth Splintered Wood. A layer of clear nail polish applied over splintered wood can close the gap enough to prevent splinters or caught fabrics. Waterproof Labels. Running clear polish over labels with a tendency to get wet (such as on gardening tools, or shipping labels) ensures the ink won’t run. Eliminate Rust Rings. Tired of rust rings on your countertops and medicine cabinet shelves from metal cans? Coat the bottoms of the cans in clear polish. Halt a Run in Tights or Stockings. A quick dab of clear nail polish can hold a tear in tights long enough to avoid an embarrassing situation. Pretty Up Peeling Pearls. Coating imitation pearl jewelry with clear nail polish is an easy way to prevent them from peeling. Fix Frayed Fabric. Loose threads or wisps of fabric making your garments unsightly? Coat them in a bit of clear polish to hold them together. Temporarily Halt a Cracked Windshield. While obviously not a permanent solution, a layer of clear polish can be used to prevent a windshield crack from spreading while you figure out how to have it repaired. Twist a Shoelace Back In Shape. Shoelace coming apart? Dip it nail polish, twist it back into shape and then let it dry. It should look just fine. Keep Costume Jewelry and Its Wearers Clean. A layer of a clear polish over costume jewelry will keep it from becoming discolored. As an added bonus, it will protect your skin from discoloration while wearing the jewelry. Seal an Envelope. Looking for a fun way to seal an envelope? 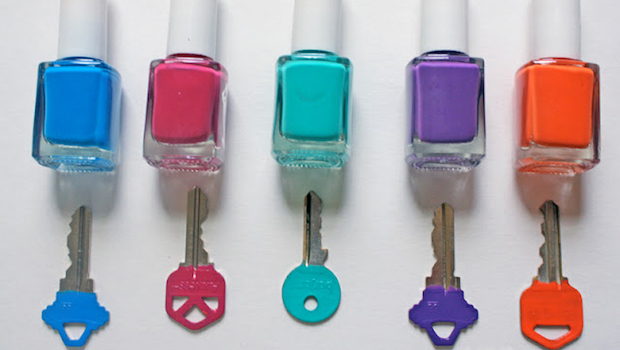 Use a brightly colored nail polish to adhere it shut. Hide Scuff Marks. Hiding unsightly scuffs on a bag or pair of shoes is as simple as covering it with a layer of nail polish. Fill In Cracked Tile. A color-matched polish can easily fill in a small crack in bathroom or kitchen tile. Secure Screws. Coating a screw in nail polish will allow it to support more weight. In addition, painting over the top of the screw will prevent rust from occurring. Seal Chipped Car Paint. Even the smallest chip in a car’s paint job can rust when exposed to the elements. Sealing it with color-specific nail polish prevents the damage, and it fixes the aesthetic blight as well. Have too many keys to keep track of? Paint each with a different polish color, that way you’ll never mix them up again. Wedding Lifesaver. Clear nail polish should always be on hand for a wedding. Not only can it be used for any mani/pedi emergencies, it can also be used to reattach rhinestones or crystals that pop off a dress. Repair Window Screen. A quick dab of clear polish can be used to seal any rips or tears in a window screen. This also includes screens on doors. What are Nail Polish Strips?